Home / 2014 / September / 12 / Looking back on 2013 . . . 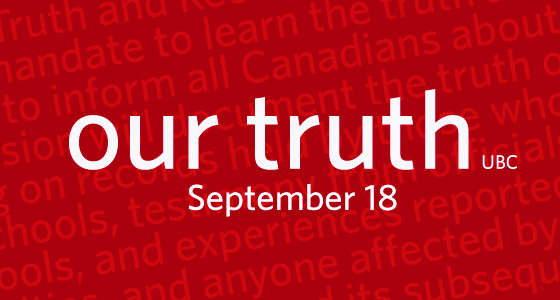 Looking back on 2013 . . .
UBC suspended classes on September 18, 2013 so that faculty, students and staff could participate in the National Event of the Truth and Reconciliation Commission of Canada in Vancouver that day. See the Video . . .
What is the Truth and Reconciliation Commission? What was the National Event? How did people get involved? 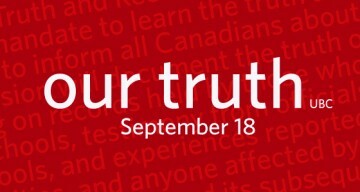 The Truth and Reconciliation Commission (TRC) was established to gather testimony and records surrounding the Indian Residential School system that operated in Canada from 1875-1996. Generations of Aboriginal children were forcibly taken from their families and communities and placed in the schools, where many suffered significant abuse and many died. For more information see the Purpose page, or visit the Indigenous Foundations website. The TRC held events in communities and in major centres to gather testimony and to inform the public about the history and effects of the schools. This history is important because it is a window on how relations between Aboriginal people and other Canadians have been formed, and recognizing and understanding it is a key to future relations. By attending this event and learning more, people became part of a fundamental change in our society. If you are a student, you can be sure to attend the Event on September 18th and the three days following and you can learn more here about all the other events that are taking place on campus and throughout the city (see What People Are Doing and Events here). You can talk about it in your classes and online, and share and develop your understanding with your friends and colleagues. If you are a faculty member, be sure to attend the Event! But also, whatever you are teaching, take the opportunity to talk with your classes. You do not have to be an expert, or teaching a course that directly addresses Indian Residential School history: you can acknowledge that you are just finding out about this history, and discuss it together. You can start by talking about why you did not learn about it in school yourself when you were growing up. There is a lot to think about. If you are a staff member, please consider learning more by reviewing the resources and events on this web site. Many events and exhibits are taking place outside of work hours or may be viewed throughout the day. Take a few minutes to investigate this website and learn about all the things that happened at UBC leading up to the TRC National Event in Vancouver. Also take some time to visit the Indigenous Foundations website, where you can read about the Indian Residential Schools and other important issues there, and watch some of the videos you’ll find there. Just scroll down on the IF home page to get started. You can also learn more about UBC and the TRC. UBC’s Point Grey Campus is located on the traditional and ancestral territory of the xʷməθkʷəy̓əm (Musqueam) people. Please visit the Musqueam Affiliation page to learn more.